Here is is, in all its glory! 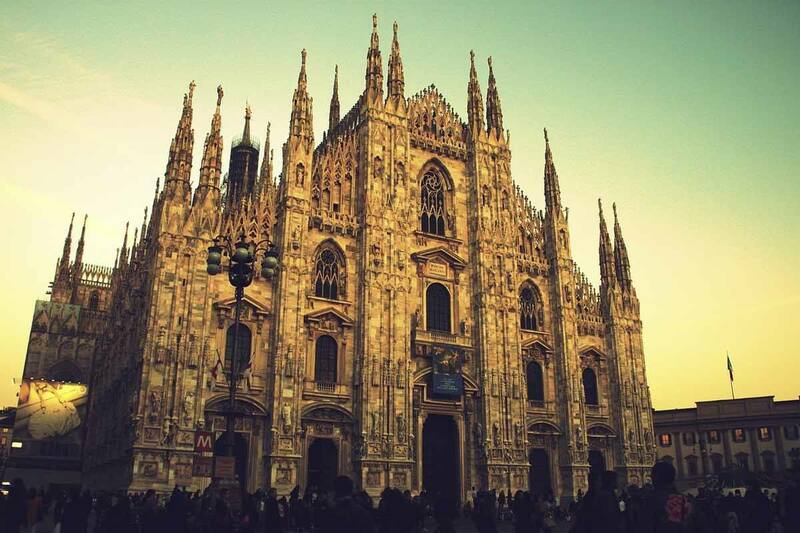 After the Last Supper, here is another of Milan’s great sights – the wonderful Duomo! Here’s all you need to know about the Milan Duomo, including how to get skip the line tickets and rooftop tickets, Duomo opening hours, and what to see inside and outside the Duomo of Milan! If you’re in Milan just for a day, and you only have time to see one thing, make your way to the Milan Duomo. The Duomo is the true centre of the city, the heart around which the city has grown – to get an idea, pull out a map of Milan and have a look. The city developed in concentric circles, getting progressively wider with the passing centuries, and the Duomo is at the centre of it all, standing proud in Piazza del Duomo, the square bearing its name. There it is, the stunning Duomo! Don’t have time to read through? 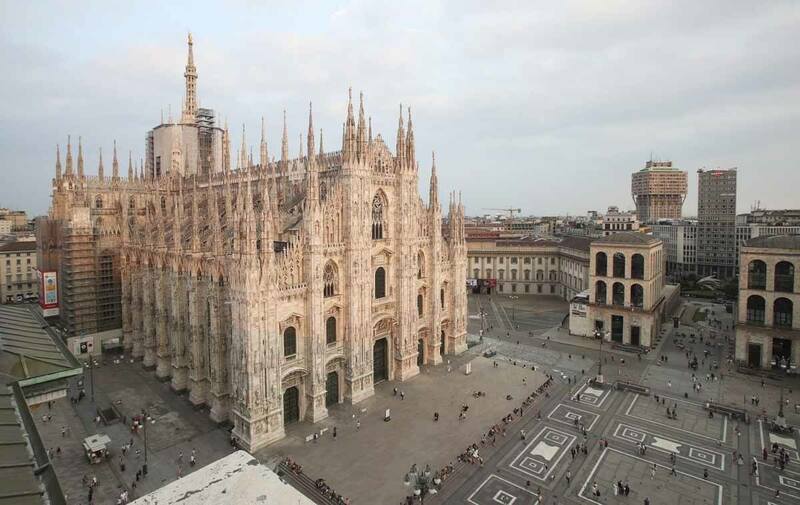 Click below to get your Milan Duomo tickets! Why You Should Visit the Duomo of Milan? The Duomo of Milan is a true marvel, the kind of place that takes your breath away. It’s Italy’s largest church, and the fourth largest in the whole world – the St.Peter’s Basilica is sometimes referred to as Italy’s largest church, but it is in fact located in the Vatican. The Duomo has enough space to sit 11,700 people inside, with a volume of 440,000 cubic meters. It is also the world’s largest Gothic building, and the church with the largest number of statues – there are 3,400 statues, 135 gargoyles and 700 other figures and sculptures decorating the church inside and outside. To appreciate the statues and sculptures decorating the Duomo of Milan, the best way is to climb up to the rooftop – not only will you be able to get a view over the Milan rooftops and over the Alps (if it’s clear), you’ll also be close to the spires and gargoyles. It’s one of the best places for views of Milan, and generally speaking it’s an excellent place for photo opportunities! Even looking at the sheer size of the Duomo, it’s incredible to think that it took over six centuries to build the cathedral. Its construction was started in 1386, commissioned by Gian Galeazzo Visconti, the Duke of Milan. The famous Navigli of Milan owe their existence to the Duomo – the system of canals was designed to carry heavy slabs of pink marble from the Candoglia marble quarry, near Lake Maggiore, all the way to the centre of Milan. The cathedral was consecrated in 1418, but at the time only the central nave was finished. Construction continued for another 200 years, then it was stopped and started again several times over the next few centuries. Napoleon commissioned the façade to be completed just after having declaring himself King of Italy in 1805 – by the mid-19th century, the Duomo looked pretty much as it does know, even though the last finishing touches and details continued to be added up until 1965. Since the construction of the Duomo took so long, it comes as no surprise that the cathedral is a mismatch of styles – the dominant style is Gothic, but it also includes some Neoclassical, Neogothic and Late Renaissance elements. The Duomo is great to see from the outside, but to truly appreciate it for what it is and what it has meant to the Milanese throughout history, you’ll have to head inside. 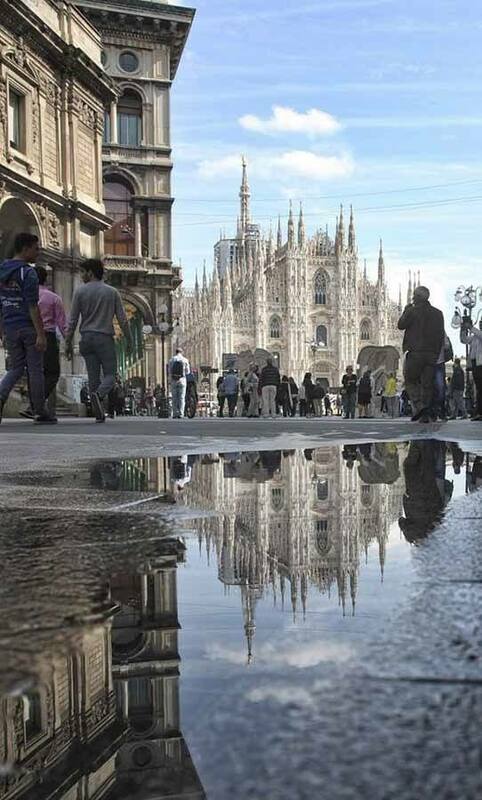 Let’s have a look at the best options for skip the line tickets and tours of the Milan Duomo! Check this post if you want to know more about other Museums in Milan! The Duomo is Milan’s most famous attraction, and it’s on the wish list of every first-time visitors – whether they’re in town for a weekend in Milan, or for just a few hours in between trains. Up until Expo in 2015, it cost nothing to enter the Duomo. You had to pay for the museum, for the rooftop and for tours, but the church was free. Nowadays, you can still enter for free if you want to go to Mass or to pray – otherwise, you’ll need a ticket to enter the Duomo. This can only mean one thing – queues. The lines to get tickets to the Duomo of Milan can sometimes be horrendous, stretching all across the square for hours on end. If you hoped to see the Duomo on a quick layover, you’ll either have to spend your time in line, or just give up. However, fear not – there are ways to skip the line to see the Duomo without having to wait. Here they are! 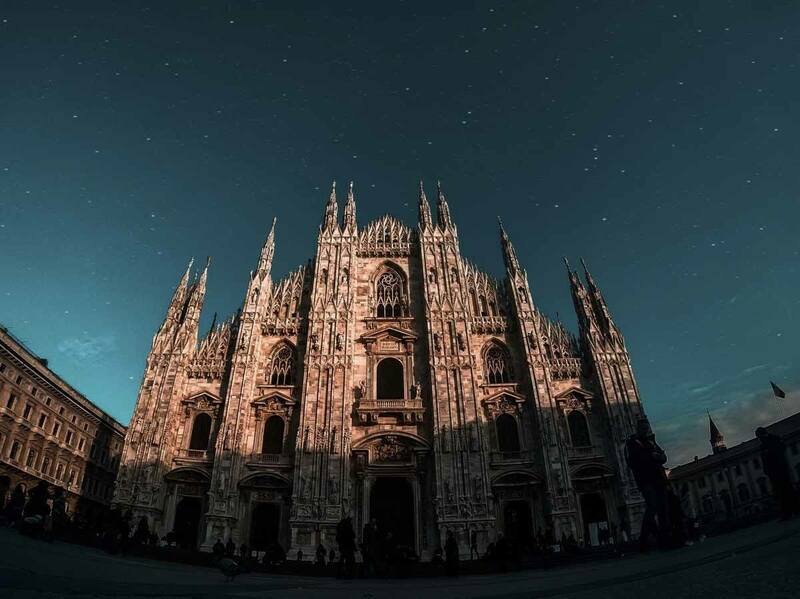 Milan Cathedral and Rooftop Ticket – this combo ticket is the most popular solution for those who want the ‘complete’ Milan Duomo experience. It includes access to the church, rooftop, museum, and archaeological area, as well as an audioguide in various languages. 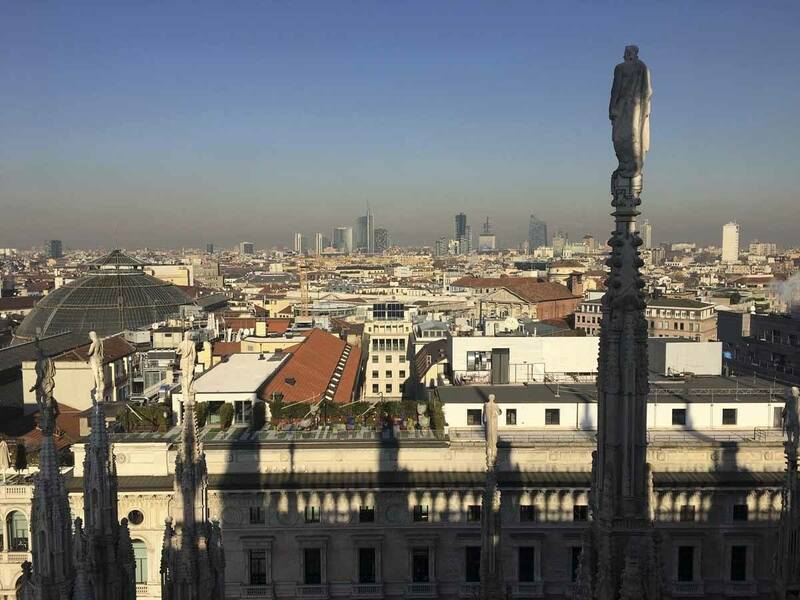 Milan Duomo Rooftop Ticket – if you have to choose between just visiting the church OR the rooftop, we recommend opting for the latter. Get your ticket in advance to skip the line! Booking a guided tour will also give you the opportunity to skip the line, while having this marvellous work of art coming to life through the words of your guide. All Milan guides are licensed and really know their stuff – joining a guided tour of the Milan Duomo is really worth the extra expense. Da Vinci’s Last Supper and Milan Sightseeing Tour – best-selling package including skip the line access to the Duomo and Last Supper. 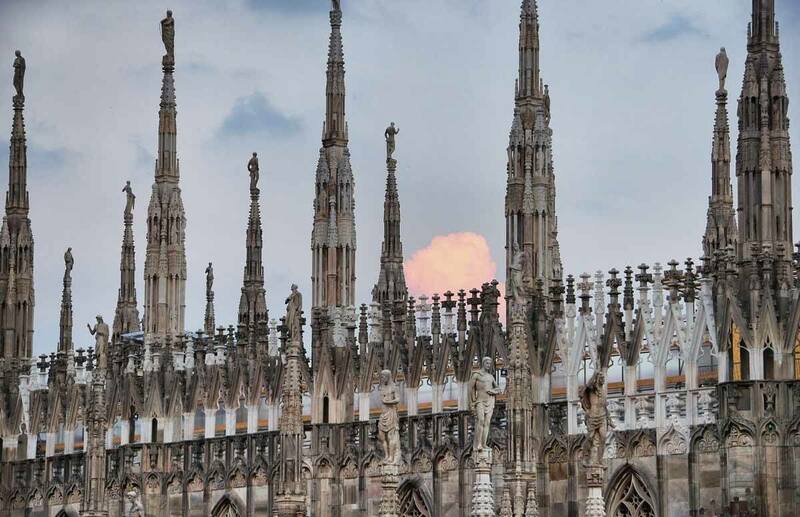 Skip the Line Milan Duomo and Rooftop Tour – a 2.5 hour tour with English-speaking guide, including both the Duomo interior and rooftop access. 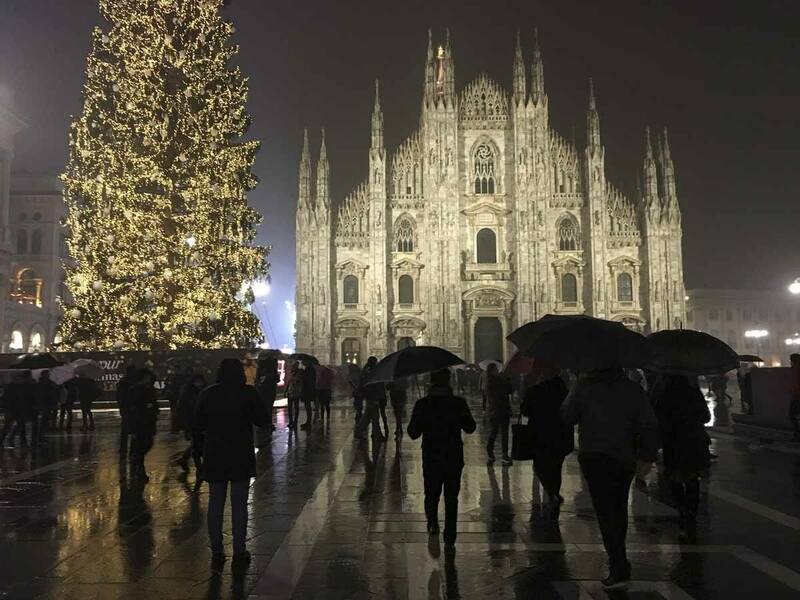 Milan Duomo Cathedral Tour – this in-depth one hour visit of the Duomo also includes a virtual reality experience and Duomo Pass valid for three days, allowing you to go back and explore independently. 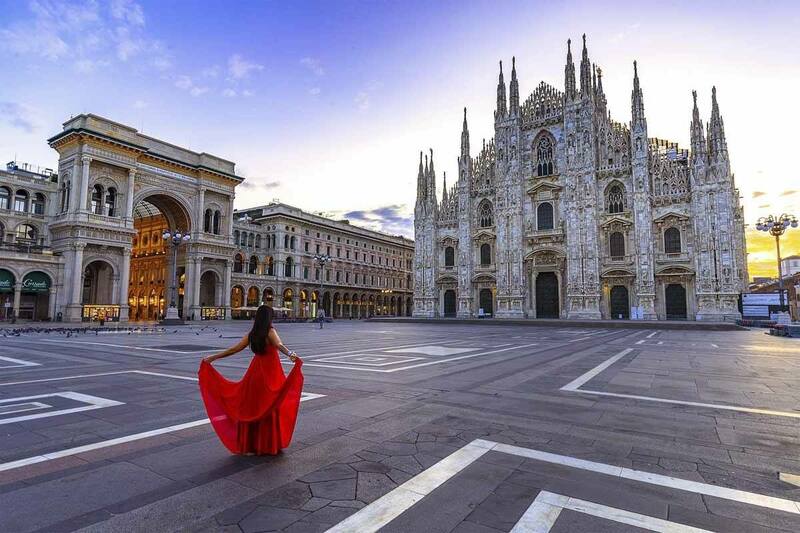 Duomo and La Scala Guided Tour – ideal for theatre lovers who want to learn about Milan’s famous opera house, and for anyone who wants to combine Milan’s two big-ticket attractions in one tour! Milan Cathedral, Sforza Castle and Michelangelo’s Pietà Tour – did you know that both Leonardo and Michelangelo worked in Milan? Learn about it all on this tour, also including the Duomo of course! If you decide on a last-minute trip to Milan, or if you’re like me and just forget to book tickets in advance, fear not – it is still possible to skip the line to the Duomo! Just visit shortly after it opens at 8 am, when the queues are usually not long. This is especially valid in spring and summer, when Milan is at its busiest. In winter time you might be ok until a bit later, say up until 10 am – but still aim to rock up early during weekends, when the Duomo is at its busiest. We’ve put together a quick rundown of what to see inside the Duomo of Milan for all those visiting without a guide, and to convince everyone that the Duomo is the best thing to do in Milan! Want a pic like this? You’ll have to visit very early! Even just from the outside, the Duomo is a stunning sight. The façade reflects the long construction time of the cathedral, with elements and decorations reminiscent of the six centuries that went by from start to end. The flamboyant spires and gargoyles are a clear Gothic element, but the façade is not as ‘vertical’ as other Gothic churches worldwide – the entire church is a kind of hybrid between the Lombard tradition, with churches that extended horizontally, and Gothic decoration. There are also Neoclassical and Late Renaissance aspects, like the large windows located on the front of the church, just above the five entrance doors – the façade is divided in five sections, revealing the number of naves found inside. The statues and carvings are the most unique feature of the outside of the Duomo, turning the building into a storybook. A guide will really help the place come to life, illustrating the reliefs depicting stories from the Old Testament and scenes from the history of Milan. There’s also a mysterious dragon/dinosaur figure carved into the right side of the Duomo’s central door – it is believed to be Tarantasio, a mythological figure that was believed to live in a now-disappeared lake, terrorising farmers and kidnapping children in the High Middle Ages. After admiring the Duomo outside, walk in and prepare to be wow-ed again! The five naves of the Duomo are so high, that sometimes it’s hard to see the ceiling, and if you walk in on a sunny day, the rays of light will hit the stained glass windows transforming the church into a kaleidoscope of colours. You could spend hours and hours touring the inside of the cathedral. The columns and pillars reaching up to the roof are also decorated with carvings and statues, with lots more statues located inside – it’s worth trying to find the one depicting St.Bartholomew, depicted holding his own flayed skin. Glass caskets lining the outer nave contain the bodies of saints and archbishops. Golden masks have been placed on their faces recently – before that, the mummified skulls were visible to all visitors. There are two other sights, ignored by most people, that can be seen inside the Duomo. One of them is a little red lightbulb located just above the apse, marking the spot where one of the nails used during Jesus’s crucifixion was (allegedly) placed. The actual nail is now kept in a coffin, and displayed every year on Sept 14th. The second sight is a sundial placed on the entrance, dating back to the 18th century. A ray of light strikes in two specific points, making it one of the most precise sundials of its time. The façade and the interiors of the Duomo are all a crescendo to the real marvel of Milan’s cathedral – the rooftop. There are two ways to go up – on foot and with a lift, with two separate tickets. If you can climb the 251 steps to reach the rooftop, we highly recommend doing so. It’s not a long, continuous climb – you climb a bit, then walk around the side of the building to enjoy a stunning view over the Galleria dome and the Porta Nuova skyscrapers framed by the spires, and then climb a little more to the rooftop terrace itself. The rooftop terrace is also the best place to see the Madonnina, a 4-meter high, gilded copper statue of the Virgin Mary, placed on the highest spire of the Duomo at a height of 108 meters. The Madonnina is well known by all Milanese, and by extension it has become a symbol of the entire city of Milan. A curious fact – for a long time, the Madonnina marked the highest point in Milan. When high-rises started being built, it became customary to place a replica statue of the Madonnina on the top of the tallest building in town – so that she could keep watching over her city. There are now three replicas of the Madonnina statue – on top of the Pirelli, Unicredit and Arcelor Mittal building. If you have time or wish knowing more about the construction of the Duomo, it’s worth taking your time to visit the Duomo Museum. It includes 26 exhibition rooms, full of tapestries, statues, liturgical objects, altarpieces and other precious objects owned by the Veneranda Fabbrica, the body in charge of the Duomo’s construction and maintenance. Exhibits are organised chronologically, allowing visitors to travel through the history of the Duomo, from its foundation to the present day, with a focus on all the artistic expressions and architectural styles that make it truly unique. The area where the Duomo was built was not a barren wasteland prior to 1386. A number of churches and other buildings were demolished to make space for the majestic church – their remains can still be seen in the archaeological complex below the cathedral. The Duomo Archaeological Area follows almost the same opening times as the church, and the same ticket is required to access, so it’s worth taking a look. You’ll see the remains of Santa Tecla Church and the Cathedral of Santa Maria Maggiore, as well as two early Christian baptistries, with fonts and remains of mosaics. Opening Times – The Duomo is open every day of the year from 8 am to 7 pm, with entry allowed until 6.10. The rooftop terraces and archaeological area are open from 9 am to 7 pm, the museum from 10 am to 6 pm, and the crypt is open from 11 am to 5 pm Monday to Saturday, and 1.30 to 3.30 pm on Sunday. The Duomo stays open during masses and other services, but we recommend against visiting during celebrations to respect worshippers. Try to avoid visiting on Saturday and Sunday morning, and opt for weekday visits if possible. Dress Code – The Duomo is first and foremost a place of worship, and modest attire is required for both men and women. Shoulders and knees must be covered at all times. There are no sarongs to cover yourself with, and you will be forbidden entrance in shorts and tank tops, so dress accordingly! What a place for a sunset drink, right? If you can afford to, we definitely recommend staying in a hotel near the Duomo! Here are some of the best ones, including a couple with actual Duomo views! Townhouse Duomo – the only five star hotel in Duomo Square, with Duomo views from some of the suites! RoomMate Giulia – colourful hotel with playful decor only a few minutes away from the Duomo. Rosa Grand – located a few minutes walk from the Duomo, this hotel is set in a refurbished historical building. 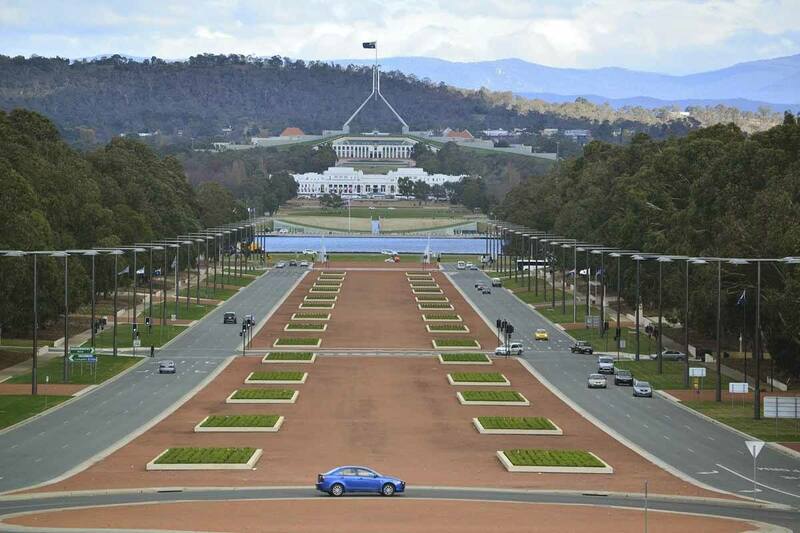 My grandmother visited it during her honeymoon in 1951 and loved it – but trust me, it has been renovated since then! 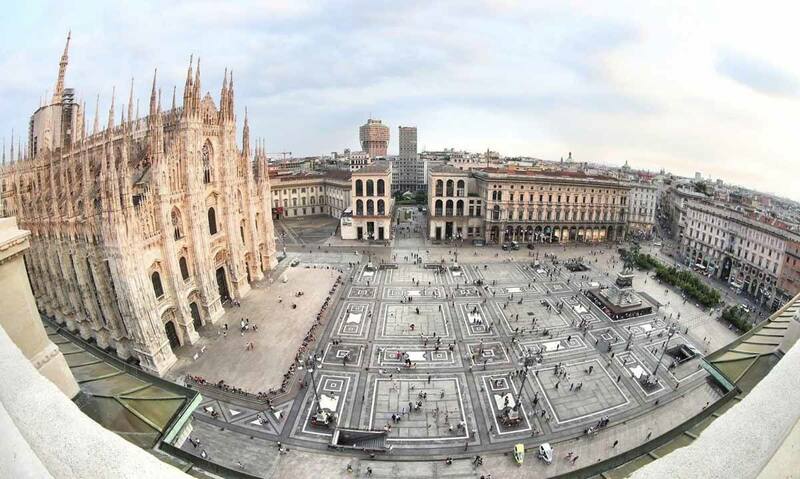 The Square Milan Duomo – modern hotel with stunning rooftop terrace and great restaurant! 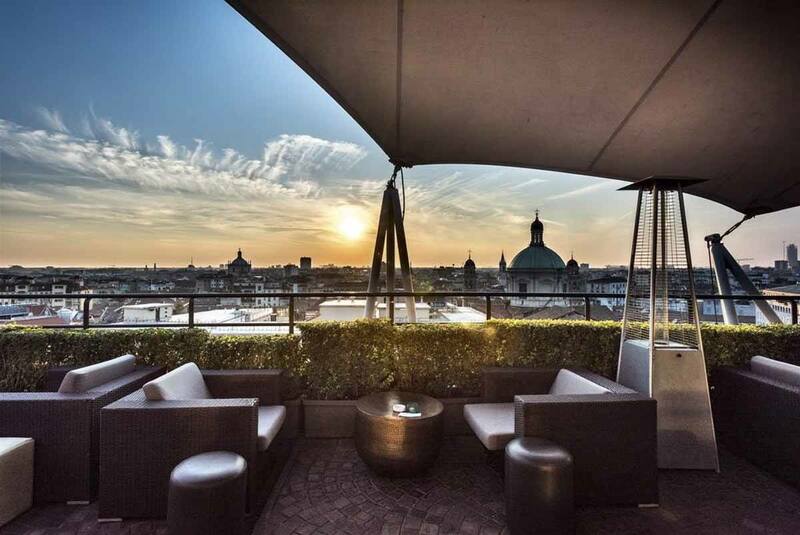 Park Hyatt Milan – another pick for luxury lovers. This is probably the best hotel in Milan and some rooms have Duomo views! Hotel Spadari Al Duomo – a solid option with great service and a luxury feel not far from the Duomo. Glamour Apartments – ideal for those who want to have Milan views without paying a fortune. This operator rents several apartments all over Milan, including one with stunning Milan views!